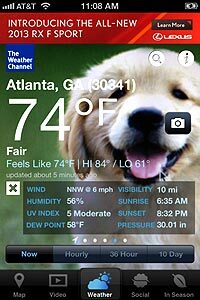 The Weather Channel has long been known for the ability to geotarget mobile ads according to local weather conditions. But now the company is going beyond DMA or ZIP code targeting. Marketers can now tailor mobile ad areas as precisely as a city block. Through a new partnership with location data provider PlaceIQ, The Weather Channel is rolling out hyperlocal targeting on its iPhone app, followed by an Android app in July and all other mobile platforms later this year. The new ad offering launches with several brands, including Chevy Silverado, Frito-Lay and Ram Truck. PlaceIQ taps a range of data sources, including the U.S. census, public social data and mobile location information from providers like Skyhook to create audience profiles for areas as small as 100 meters by 100 meters. It uses proprietary algorithms to analyze data, along with time-of-day information, to score each 100 meter “tile” against a given demographic. The company explains that its ad-targeting technology creates a “hyperlocal digital index of the physical world." It understands what is there, who is in a place, and when, and what they are doing on an anonymous basis. “This gives us the ability to target beyond the ZIP code level down to an inference of who an individual consumer is likely to be, based upon where they are, and the day and time on which we serve them an ad,” said Patrick McCormack, vice president, mobile sales and strategy, The Weather Channel Companies. For example, an advertiser might be able to target a business traveler at LaGuardia airport on a Monday morning. Hyperlocal campaigns on Weather Channel mobile properties could also be national -- aimed at business travelers at certain times at airports, hotels or other narrowly defined locations across the country. The Weather Channel introduce hyperlocal targeting with the release of its update iPhone app about three weeks ago. McCormack said it won't have early campaign results to discuss until the end of June. But he noted the company was pleased with the performance of PlaceIQ-powered ads in trials before the release of the redesigned app. Offering marketers enhanced ad options is especially important for The Weather Channel as it seeks to monetize its fast-growing mobile audience. Its monthly mobile audience of 30 million (on the mobile Web and apps) now drives more page views than on the desktop Web, according to McCormack. “That trend continues, and I don’t think we’ll ever look back,” he said. McCormack added that The Weather Channel will charge a premium for hyperlocal targeting but emphasized it would also be a more efficient buy, since the service delivers improved ROI. The deal with PlaceIQ, however, doesn’t mean the company can now start tailoring ads by weather conditions below ZIP code level -- if that’s even necessary. “Weather is a critical element in driving consumer behavior, so putting weather into the hyperlocal equation is interesting, but we’re just not there yet,” said McCormack. For PlaceIQ, which raised $4.2 million in first-round venture funding last year, The Weather Channel is the first publisher its worked with to integrate its targeting technology. PlaceIQ CEO Duncan McCall said the company wanted to start with a high-profile mobile brand like the Weather Channel, but is now talking with other Web and mobile publishers about using its system as well. On the ad side, PlaceIQ earlier this year announced teaming with Jumptap to provide hyperlocal targeting to publishers across its mobile ad network. 2 comments about "Weather Channel Adds Hyperlocal Targeting". Jessica Estremera from DIgital Pulp, June 12, 2012 at 4:45 p.m. This is a very unique tool for mobile advertisers who will be able to identify their target audience and plug their products at the precise time they will be most engaged. Looking forward to other companies who will use this "Hyperlocal" targeting. Lauren Oliver from Cloud Nine Media, June 22, 2012 at 2:20 p.m.
Great news from PlaceIQ and The Weather Channel. Looking forward to more companies getting on board. More hyperlocal targeting = better for consumers, better for advertisers!